When the doldrums set in, it’s time for refreshing your surroundings. If it’s too cold to go outside you will want to make your home the most inviting, comfortable and cozy place it can be. So here are five of my best strategies for quick refreshes that will make a big impact on your space. Add some color to the walls! If you are ready to invest in a few hours of work to make the biggest impact, then grab a gallon of paint and change your wall color. Painting is not hard, it just takes time to do it. Anyone can wield a paint brush and transform the identity of a room. So….go from white to a warm taupe (take a look at Benjamin Moore’s Alphano Beige, #989.) Go from beige to a glam shade of copper (check out Benjamin Moore 14 Carrots, CSP-1110.) Go from a light blue to a sophisticated steel blue (and see Porcelain Glaze, CSP-550.) Consider making a statement by painting one wall color a strong accent. Recently I repainted my office with a strong burnt orange color on my north wall (in Feng Shui terms: I put a strong energy color on my wall of abundance and reputation.) My staff loves it and it brings a bright, happy feel into the room. But if you’re not willing to invest time and energy into that kind of project right now, then add color by selecting an accent color you love and add some decorative pillows. Change the art on the walls. 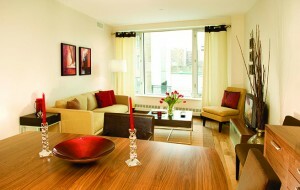 Add some vases and decorative pieces in that accent color and you will see the room take on a new feel. Add more light! Add a new floor or table lamp. Yes, we know you’ve been postponing shopping for that light fixture. Well, now is the time to do it. Adding more light and making your space brighter definitely helps to raise the happiness spirit of a room. Look for lamps that have a 3 way switch so that you can control the light making it brighter when you need it and softer when you want to create a soft evening mood. Also look for shades that add some decorative interest: it could have a pattern or texture. It’s another way to add spark to a room. 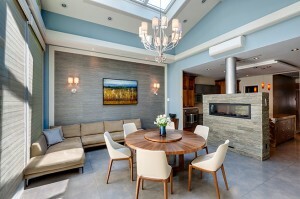 And if you’re really handy, you may want to consider adding recessed downlights in the ceiling or sconces on a wall. These types of fixtures will really add brightness and sparkle to a room. But remember to always install dimmer switches so you can control the light and mood in that room. Change the furniture placement in the room. We get used to walking into a room and seeing the same furniture layout all the time. Well, make a change: move the chairs into a different location. Consider switching a piece of furniture from one room to another: maybe it’s a chest that you have in your bedroom that would make a nice addition in the hallway; maybe it’s a chair from a different room that would be a good change. Think about your options. You may be surprised how “new” a piece looks when it’s moved to a new location! Consider reupholstering a beloved chair or adding a new one. Select a new pattern that works with your new or existing color palette (and this could be a good way to add color too.) Maybe it’s a pattern that has texture too. Both pattern and texture are strong ways to change the look of a room. So scour those warehouse sales, check out the current stock at your local Home Goods store, and visit the higher end thrift stores to get a great chair that make a design difference! Print, frame and hang those great photos you love! It always gives me such a sense of pleasure when I finally have one or two of those great travel photos I have stored on my computer printed and hung. Too often we never have a hard copy of the best ten shots we took of that great moment, loved one, family time, party, place, pet… We have thousands of just perfect shots! So get them printed and on your walls! First, decide where they will go, how many you want and how you will frame them. A good size wall can take a collection of frames to create a design statement. The smallest you will want to choose is generally 5” x 7”, but it’s fun to do a mix of a few picture sizes on a wall. I like to go to Michael’s or my local frame shop and find a frame style I like and then choose a couple of the sizes. Go ahead and lay them out on the store floor so you can select the right size frames that work to make a good arrangement for the wall you chose. Then get the prints made: online there’s Adorama or Shutterfly where they will make any size print for you. Then insert into frame and hang on wall! 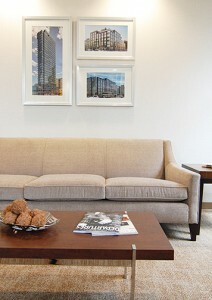 If you’re in a rush, check out the Pottery Barn Gallery frames. There are usually five or six different sizes of the same finish frame in a set. When placing the order for prints, you can order the same image in a couple of sizes (it’s usually not expensive to do this and it gives you more options when you’re setting up the frames.) Then when you have the frames, enjoy putting your favorite photos in and seeing them on the wall. It will make for a great collection while adding color and interest and personality to the room! For help with new décor ideas, check back for our upcoming launch our Luxury Home Collection! We’ll have coordinated paint schemes and color palettes with decorative objects for you to easily and quickly “Refresh” a room!